A street cat from London, England, endeared itself to its rescuers after they discovered it had the "grumpiest-looking" face no matter what mood it was in. Named Saul, the street cat had been discovered in poor health and assumed to have been hit by a car. Saul was sent to the Royal Society for the Prevention of Cruelty to Animals' (RSPCA) Putney Animal Hospital, according to a statement. RSPCA England also posted about the "grouchy ginger" cat on its Facebook account on Nov. 6. "Salty Saul" was found by a gentleman wandering the street in the rain on Oct. 15. He was in a "very sorry state" and had discharge coming from his eyes and nose, said the veterinary director for RSPCA London, Caroline Allen. "He looked very poorly indeed," Allen added. Doctors also found Saul had injured jaw, teeth and eye. As Saul continued to recover from his injuries, the hospital staff became unsure if the tomcat's persistent scowl was a natural facial feature or partially caused by Saul's recent injuries. The cat didn't have a microchip implant, which suggested Saul had been a stray all his life. Yet, despite his dour appearance, staff found Saul to be a rather affectionate kitty that enjoyed getting pampered by the nurses. Once fully healed, Saul will eventually need to move to RSPCA's cat home in London's Southall district and be put up for adoption. 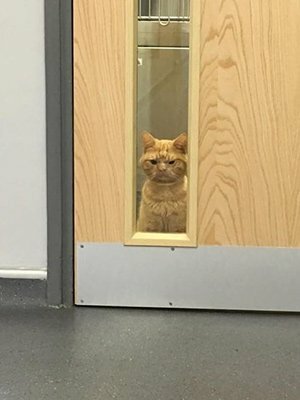 Given Saul's unique appearance, the hospital staff had little doubt the grumpy-looking cat will find a good home.